I figured out why it seems like we're so much busier than normal this summer. I mean, we're always super busy during the summer, but this year? Busy-ness has escalated to the next level. It's because we're doing all the same things we usually do in a summer: family trips, Boy Scout camps, football camp, VBS, swim lessons, fun local outings, but instead of our usual 12-13 weeks, this year we get 10. Everything is compressed. There was one day this summer that we could schedule the kids' Christmas gift trip to an amusement park. One. (Glad I realized and got it on the calendar before the day passed). The kids go back to school 7 weeks from today. That's the reason our summer is so short this year. The school district is making improvements to the high school, and they are beginning this coming school year early so they can end early, and the following school year will start later than normal, so they'll have a nice long summer break in which to finish everything. I cannot imagine what that summer will be like. Hopefully awesome and amazing. Definitely long. Wanna know what they started with? On the improvements? The football stadium and parking. They did it that way because those were things they could do while students were still in the building, but still, it's interesting to think that might be where the school district's and community's priorities lie. Gonna get those done first, just in case construction falters. No worries about classes meeting in bathrooms. It's all good. AKD will be a senior this school year. That means we're gearing up for all the lasts. Last first day of school, last bike race season, last Homecoming, last final exams, last year (God willing) living full time with mom and dad (not that I want to get rid of him, but that has been the goal from the beginning--to raise independent, self-sufficient adults). Bubby will be in 4th grade. He's not changing schools, nor is it his last year in his school, but since I mentioned the other two, I figured I should mention him, too. For some reason, our family always seems to go on a trip just as soon as school lets out. And for most people, that wouldn't really be a huge deal. But for us? We always seem to go on trips where we need to pack gear and food and stuff that is not just clothes and toiletries. It's a lot to manage when my brain space is taken up with last days of school stuff. 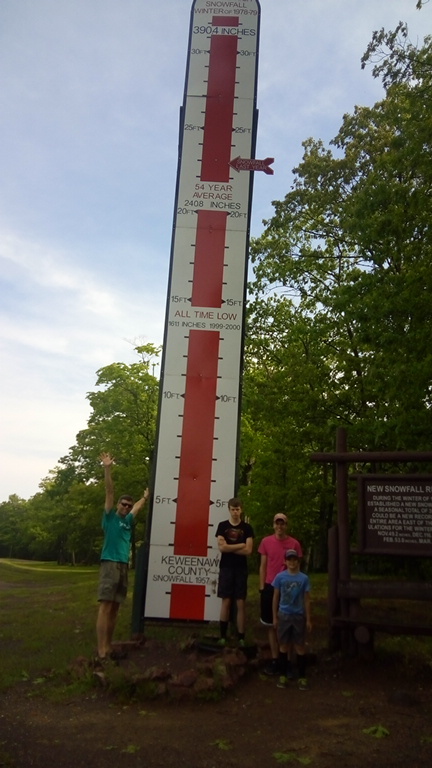 For this year's trip, we headed to the upper peninsula of Michigan (which really should be part of Wisconsin--you can ask AKD why it ended up with Michigan) for a backpacking trip, followed by a visit to the Keweenaw peninsula (that's the part that sticks up like a thumb). Mosquitoes like me. A lot. Then again, what's not to like? I didn't take very many pictures, but I did get this one. Did you know that they average over 200 inches of snow a year in the Keweenaw peninsula? That's like stacking all three of my kids on top of each other and adding a very tall hat to the top one. You never really see the road in winter up there. Anyway. Our summer is busy. How's yours going? Y'all. Do you realize we've made it all the way through June with menu plans posted each week? Amazing. I purchased another Wildtree bundle and it came this week. This time I'm doing it on my own, and without the deadline of having to go to someone else's house to do the prep work, I'm not sure when I'll get to prepping those meals. I'm happy that they're slow cooker meals this time, which means less preparation on serving day. That will be much appreciated when I have two kids in football and a third on the bike team this fall. 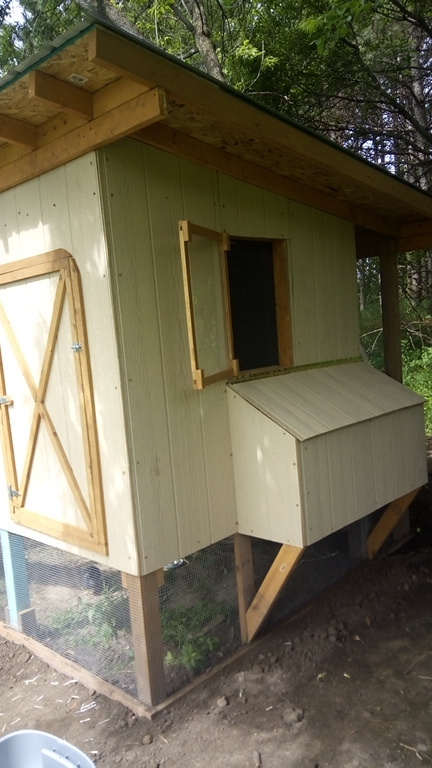 We did a coop-building-blitz this weekend, and finally on Monday it was done enough for the chicks to move in. There are still a few details that need to be finished, but it is good for now. 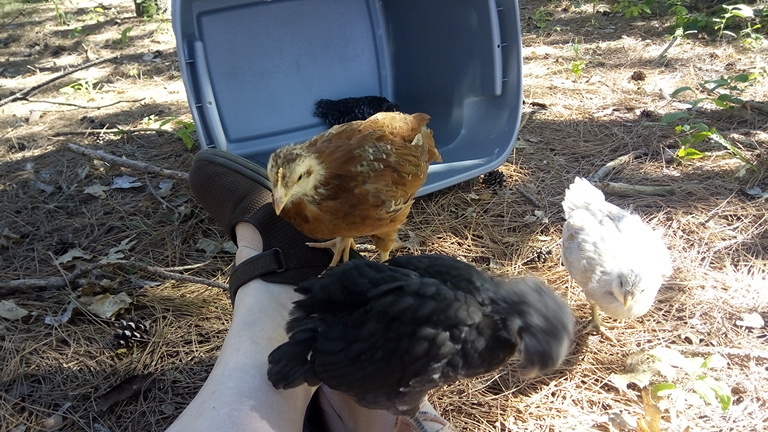 And none too soon--we left town for a week and when we returned the girls were HUGE. No wonder they kept knocking their food over while we were gone. As of today, the girls have been with us for 6 weeks. 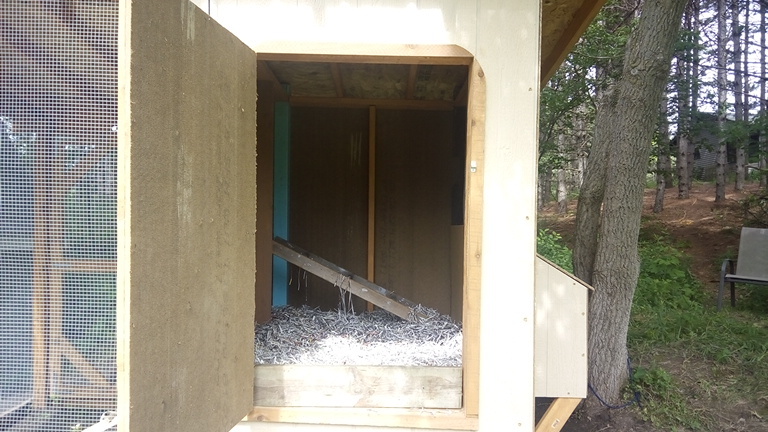 Here's the view I've been showing y'all during the building process--you can see the run, ramp, chicken door (some people call it a pop door), and people door. You can also see the people door to the run in the back. 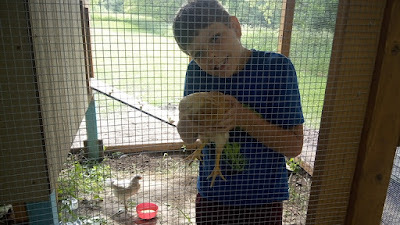 And a couple of chickens. And a couple of kids. See those black things to the left of the people door? 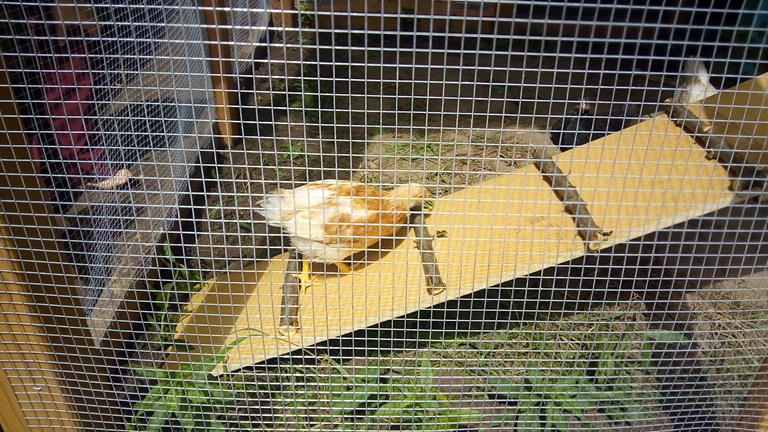 Those are pullies and a lock to raise and lower and keep in place the chicken door. Inside the hen house, looking from the people door. Hubby used an old ladder for the girls to roost on. When they're bigger, the ladder/roost will be raised to about 2 feet off the ground. Toasty Crunch on the ramp. Hubby used an old desk top that he found on the side of the road for the ramp, and branches for the cleats. The girls are able to navigate it ok, but it's quite slippery between the cleats, and they're not quite big enough yet to just step from cleat to cleat, so I think we'll be putting a few more branches on. This is the nest box side of the hen house, with a window up above. 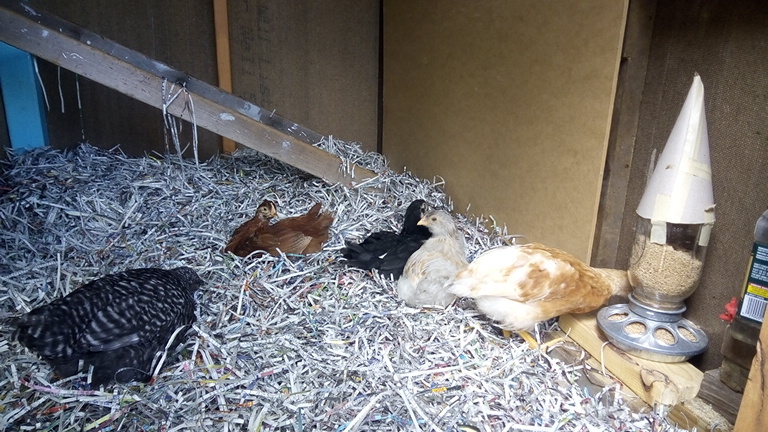 The nest box is one of the details that needs to be finished, but since the girls won't be laying until they're about 16-20 weeks old, it's not critical right now. In fact, the nest box is inaccessible from the inside of the hen house right now. 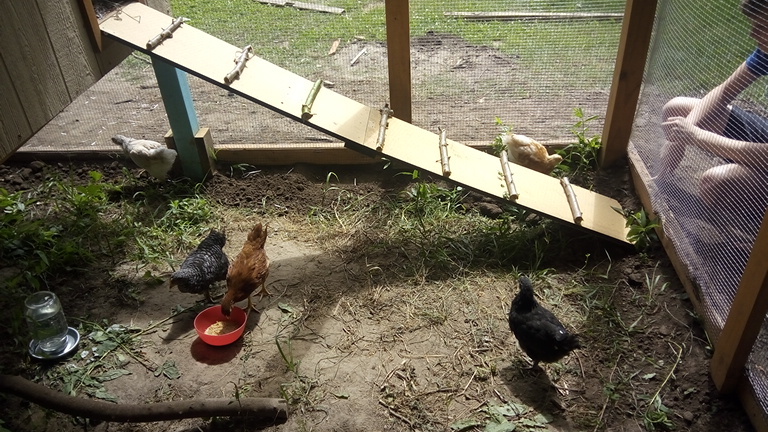 Esther (by the post), Rocky, Red (by the red bowl), Toasty Crunch (far side of the ramp), Austro, hanging out in the run. When I think about how little they were when we brought them home, I'm just amazed. I don't think we could even put one of them in the box they came home in now (and those boxes could fit up to 15 chicks). 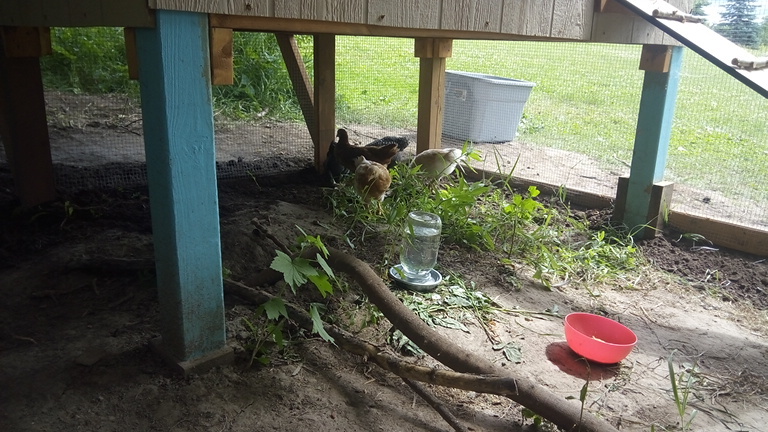 I put the Mason jar waterer down in the run so the girls have access to water without having to climb the ramp. I also put their fermented feed in the run. This week I ramped up fermented feed production because they really like it and because they're getting so much bigger. Bubby and Toasty Crunch. Bubby is single-handedly doing the bird-taming around here. We want them to be used to people, and not run away when we approach. He picks them up as often as possible, and generally, they tolerate him. A friend asked me about chicken start-up. Like what's needed, and how to do things. I told her I'm all about cheap and easy. 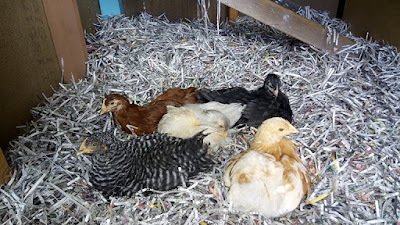 In line with the "cheap" directive, I'm using shredded newspaper for bedding in the hen house. So far, so good. 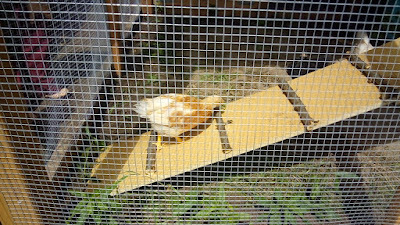 A little bit has migrated out the people door and the chicken door, but it's biodegradable, so it's all good. 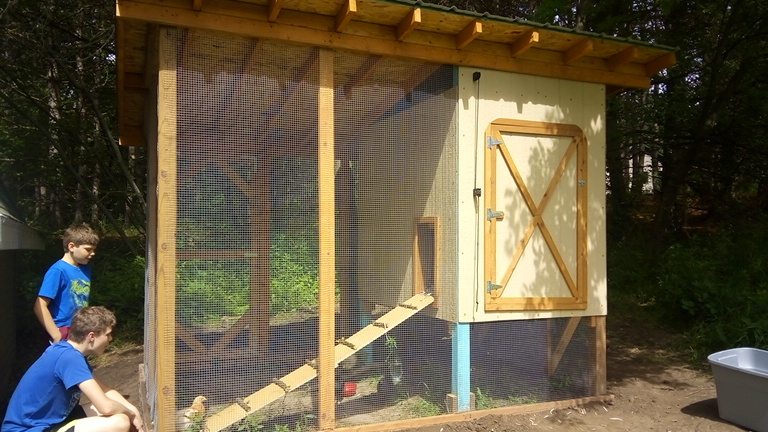 I put food and water in the hen house, too. Hopefully within a few weeks I'll have the bigger/adult/permanent feeder and waterer made--those will be hung in the run. The bigger feeder and waterer qualify for the "easy" directive. Bigger, so I (actually, hopefully Bubby) don't have to fill them as often. The girls, snuggled in. Rocky, Red, Esther, Austro, Toasty Crunch. Hi everybody. As you may remember, one of my goals for this year is to try one new item from Trader Joe's each month. And I was really good about telling you what those items were in January and February. You probably were able to ascertain what my March purchase was, since I did mention it a couple of times, but then...nothing. Sorry folks. It's not because I haven't accomplished my goal these past couple of months; I just haven't told y'all about it. Here. Let me make it up to you. In March, I bought the Mandarin Chicken. This is the one item that comes up every time I google, "what should I buy at Trader Joe's," so I knew I had to try it eventually. The family liked it. It was sweet and spicy. Yum. I definitely recommend serving the sauce on the side so everyone can personalize their own sauce experience, especially if you have picky eaters. In April, I bought Trader Joe's Dark Chocolate Peanut Butter Cups. There was really never any question of whether or not I would like these--I knew I would. I mean, dark chocolate and peanut butter is, perhaps, the world's best flavor combination. I will say that, because of their small size, I feel like the peanut butter to chocolate ratio was a little less than I would like (higher surface area to volume ratio meant more chocolate, less peanut butter), but they were still delicious, and disappeared fairly quickly. This is the first item that I've purchased this year that I definitely want to get again. In May, I bought Trader Joe's Coconut Cashews. In June, I decided to try Trader Joe's Dark Chocolate 73% Cacao Super Dark. I like other brands of 70-75% cacao chocolate, and at just $2 for a 3.5 ounce bar of organic dark chocolate, the price was right. I did like it, as I knew I would, but I discovered that I prefer chocolate bars to be thinner than this one was. With a thinner bar, it's easier to take a bite and let the bite dissolve in my mouth, but I found myself chewing this thicker bar. As a result, I didn't savor it in quite the same way as I would with a Lindt or Ghirardelli chocolate bar. What's next for me and Trader Joe's? Well, I always go with an idea of one or two things that I might want to try, but more often than not, I just wander until something speaks to me. "Take me home," they say. I do know that eventually I need to try the cookie butter--I'm thinking that might be more of a late fall item, though. I've also had my eye on some of the granola and snack bars--they look to be made with quality ingredients, and the price is better than average. And now that I've tried the coconut cashews and loved them so much, I think I'll be taking another look at the specialty nut selection. It worked last week, so how about another blast from the not-so-distant past menu plan? Remember, it's new to you, so it's all good. Right? Right. The radishes have done well. I've done four harvests, including this one, and there are still more coming. The staggered planting has been very effective for us. 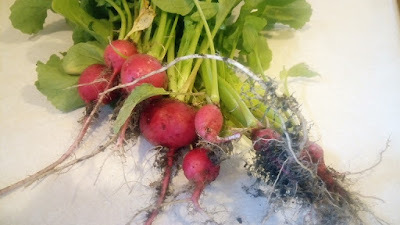 Hubby gets just enough radishes at one time for a meal or two. I'm done planting for the spring, but I might plant more in the late summer for a fall harvest. If I get to it, that is. The radishes on the right, the ones with more dirt stuck in more fine white roots, were in the process of bolting. I should have left them, and attempted to harvest the seeds. 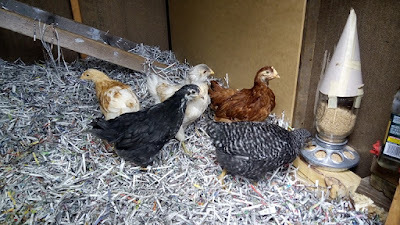 I did give one of those to the chickens, and last I looked in on them, they were investigating cautiously. 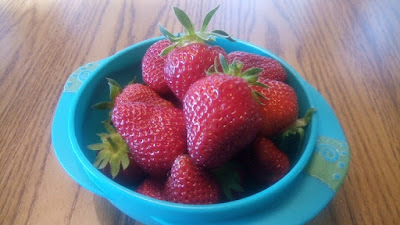 Our strawberry harvest has already surpassed last year's harvest and there are lots more berries forming, so it appears my rodent control measures have worked. We have a mix of June bearers and everbearers out there--I'm letting them run this year to hopefully make new strawberry plants. I also planted some bare crowns, but nothing's happened with those yet. I noticed the first flowers on the sugar snap pea plants, so those will be ready soon. I haven't yet gotten around to planting the corn, tomatoes, or anything else that might catch my fancy at the nursery. Whoops. 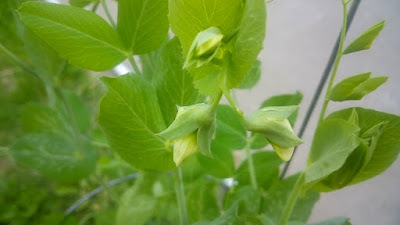 I wonder if I'll be able to harvest anything this summer if I plant next week? My youngest child doesn't go to Sunday School (we call it Creation Station). And I'm ok with that, since Creation Station meets during worship, and I want him to be in worship. However, because he hasn't been going to Creation Station, he's not really learning the stories of the Bible. I mean, he knows the biggies, but a lot of other stories are lost to him. Enter My Bible Adventure Through God's Word: 52 Bible Stories for Kids. We do have family devotions each evening, and most recently, we've been reading the actual Bible--but there is a lot of--dare I say--boring--stuff in there, at least it's boring to 9 year old boys. Before that we were reading a devotional book, but while the book contains scripture passages, they're just a few verses lifted out of context. I want my kids, at least at this age, to learn the stories of the Bible, so that when they start digging deeper as teens and adults, they will have an overall context in which to place their readings. My Bible Adventure Through God's Word contains 52 stories. Each six-page chapter includes the scripture, taken from the International Children's Bible, a brief explanation, a prayer, and "Take It With You," which is a one-sentence summary of what the story can mean for Christ-followers. For instance, the "Take It With You," for the creation story is "In creation, God gave me all I need." Each chapter is written by a different pastor, children's minister, or leader who has a heart for helping children become lifelong believers. The publisher's suggested ages are 8 and up or grades 2-5, and I would say those are accurate if you're expecting the child to read the devotions, but it's definitely great for all ages to listen to and read. I like this book--it is just what I was looking for, and while it's not possible to include every single Bible story in this one book, it does hit on the big ones, and some not so big ones, too. The stories are chronological, following the flow of the Bible. The length of each chapter is just right to stretch into two nights of reading: we read the scripture passage the first night, and the explanation, prayer, and take it with you the next. Doing it this way, we are able to remind the kiddos what the story was about and reinforce it the second day. There are two things I'm a little disappointed in. First, in order to fit the scripture into 2-3 pages, it is often necessary to abridge the content, so sometimes there are gaps in the story as the text jumps a few verses or to the next chapter. This bothers me because some details are necessarily left out, and because sometimes the transitions are less than graceful. Second, sometimes the explanation really just summarizes or repeats the scripture passage with little to no commentary. This seems to vary depending on the individual author, and was more bothersome when we were reading each chapter straight through in one sitting--basically reading the same thing twice. Bottom line: This is an excellent resource to teach children the stories of the Bible. Well. If I can't get it together to tell you what we're planning on eating this week, I can at least tell you what we had last week, right? And even though it's not new to us, it is new to you, so it's still helpful, right? Right? Please tell me I'm right. This is our last week of school, and then we're launching head-long into our ten week summer. I am hopeful that, despite its busy-ness and scheduled-ness, these couple of months will renew and refresh us for a productive school year. Tell Me How This Ends Well by David Samuel Levinson is the story of the Jacobson family: father, Julian; mother, Roz; and adult children, Mo, Edith, and Jacob. In 2022, American Jews face an increasingly unsafe environment, as the family gathers together for Passover in Los Angeles. Mo is an out of work actor, Edith, a professor of ethics accused of sexual harassment, and Jacob a gay playwright living with his boyfriend in Germany. Roz is ill, and patriarch Julian is controlling and narcissistic. This is not a happy or healthy family, and the kids decide that their father must die so that their mother can live her final days out from under his tyranny. The book is told, in turns, through the eyes of each of the children, and then their mother. It is well written, and while the situations are hyperbolic and extreme, they were really not all that unbelievable, and really made me think. To be truthful, about halfway through I was wondering how the book could end well. It started slowly and didn't really hold my interest, but I stuck with it. As the book progressed, the author artfully peeled back more and more layers of complex relationships, personalities, and motivations, which drew me in. On a side note: I am supremely satisfied with the ending. Bottom line: Well written. Started slow, but made me think. I received a copy of this book for free from the publisher through Blogging for Books in exchange for my honest review.